Oho this beast is 12%! Glorious! 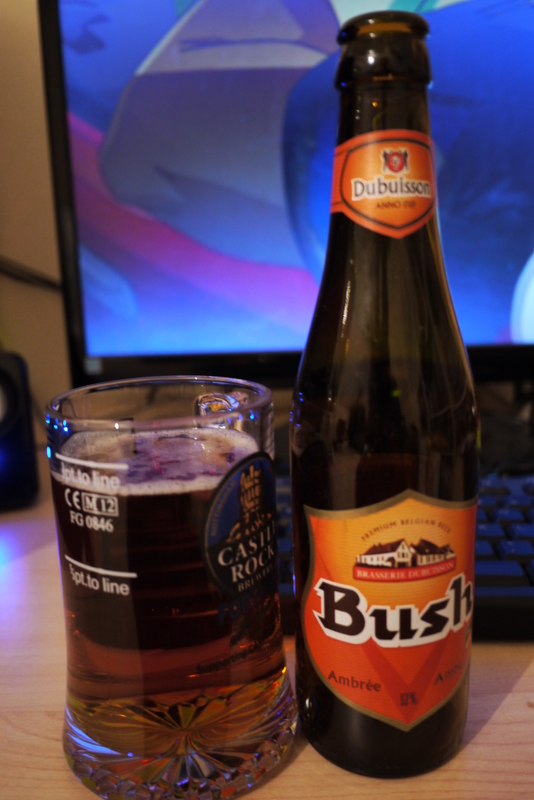 This beast has a name and that name is Bush amber from Dubuisson brewery. I really like strong ales and this one did not dissapoint. The alcoholic aroma is quite overpowering of other aromas to be honest, but also quite liquor like with hints of caramel. It is such a lovely warm drink, really at the back of the throat and it lingers so you dont find yourself drinking it too quickly. There was another taste that was bugging me, so I did look at some other reviews to figure it out, it ended up being butterscotch and within some limtations I can agree on someone mentioning cough syrup. Sweet yet bitter with an underline of fruity notes comes to mind. As much as I liked this one, I would not want two in a row, it got less flavoured, less persistant as someone put it. This would be one I would get lots of people to try just to watch their reaction.